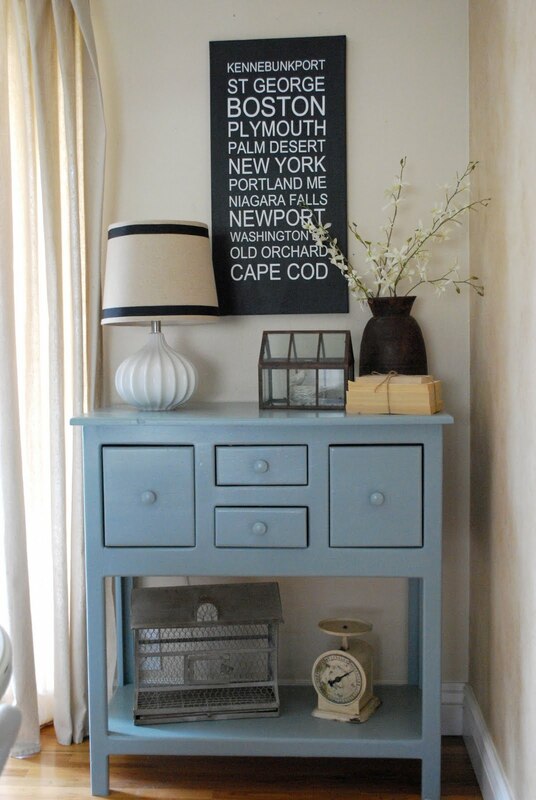 Okay, so I have to preface this post by reminding you that I have an obsessive need to constantly tweak and redecorate. So I had barely finished redoing my small buffet (as seen in this post) when I already had the desire to tweak it. Don't get me wrong. It was pretty. Just not quite "me". Know what I mean? The more I looked at it, the more I knew that I wanted to bring back a bit of the black. I like the sophistication that a bit of black brings. I also have been crushing on all the subway art signs that I have seen floating around blogland. So I decided that it was high time I made some for myself. 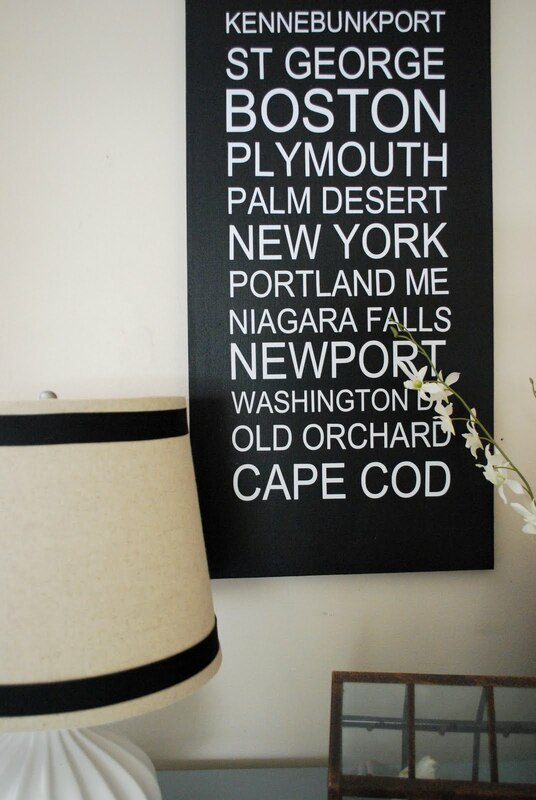 Here is my version...filled with cities that are meaningful for our family. For example, Kennebunkport, Maine - at the very top of the sign - is where the hubby and I spent our honeymoon. Newport, RI is where we spent my 24th birthday. Just last year. (ha, just kidding!) You get the idea. When I put it up on the wall, I knew other things were going to have to change as well. 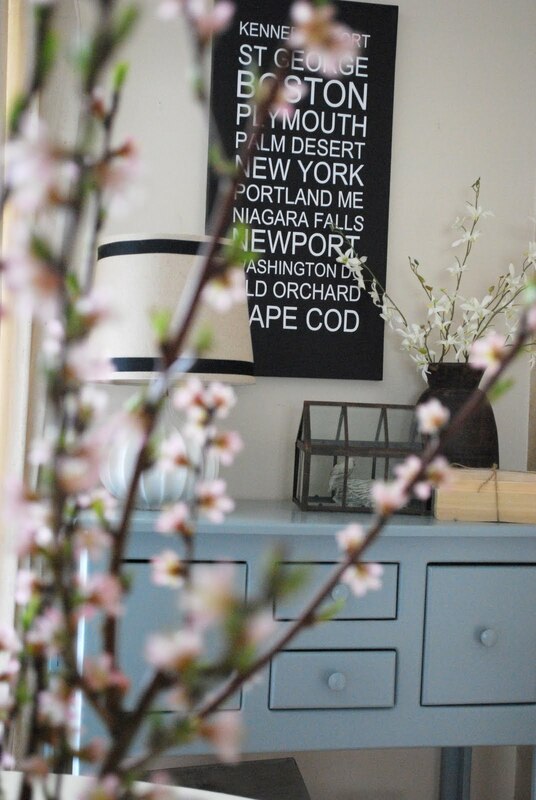 The pretty pink faux cherry blossoms looked much too sweet against the sign. So I replaced them with white blossoms in a rustic vessel. Then I brought back my pretty terrarium that had previously been on the buffet. 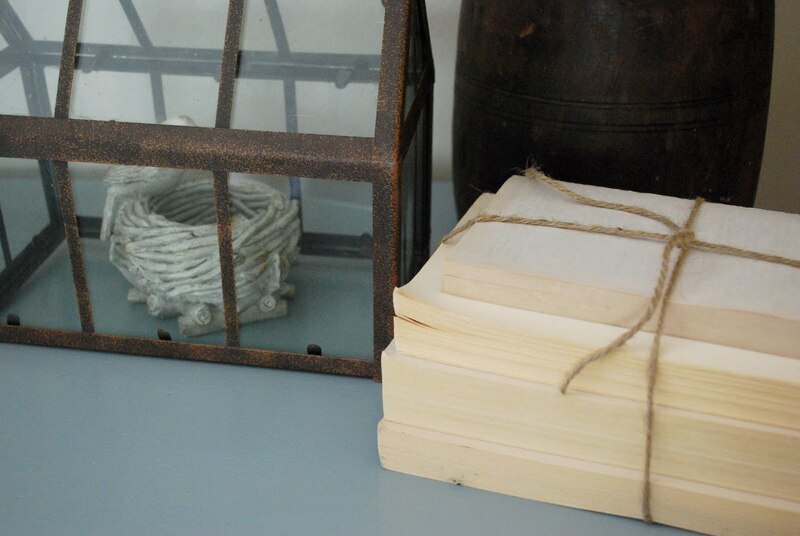 But the two things looked a little bit lonely, so I added a stack of old books tied with twine. 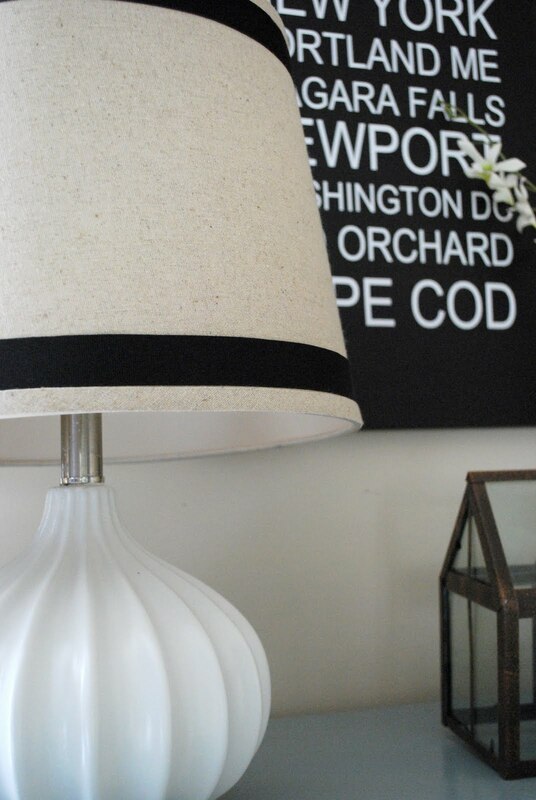 Finally, I decided that the lamp needed a little bit of zing, so I added some grosgrain ribbon around the top and bottom. A little dab of hot glue holds the ribbon in place so that I can easily remove it when I'd like another change. So here she is...the little buffet all done over (again.) I'm lovin' this version. And that cute subway art? I'll have a tutorial for you soon. It looks great. A bit of black always makes an impact. It looks fantstice and I can't wait for the tutorial. I've been wanting to make one for our home too! Absolutely perfect...but I wouldn't have expected any less...;) It's true...the black really does add a touch of sophistication - I love it! Looks wonderful. AND makes me feel so much better that I am not the only one who has to keep tweaking things!! Lovely! I'm also in love with all of the 1940's "Stay Calm..." materials out right now. My father-in-law saved one from his time in the RAF and I'm having it framed right now. Awesome! I think your before and after are both equally amazing. Love the subway art! I hope to try making one soon. Loved the first, but really LOVED the second! The black gave it the POP that was needed! Can't wait to try the "subway" art! Your new sign looks perfect there! Love that you used meaningful cities, what a great idea. And the ribbon on the lamp! Love it! But the idea of the meaningful cities is way cool! It looks great and I can't wait to see how you made it! You are right about the sophistication added by a little black! I love the before too, but the after is just perfect! Girl, you have the touch! Everything looks perfect! Love the new look! I have been crushing on the subway art too! We are going to have to get a few for sure! 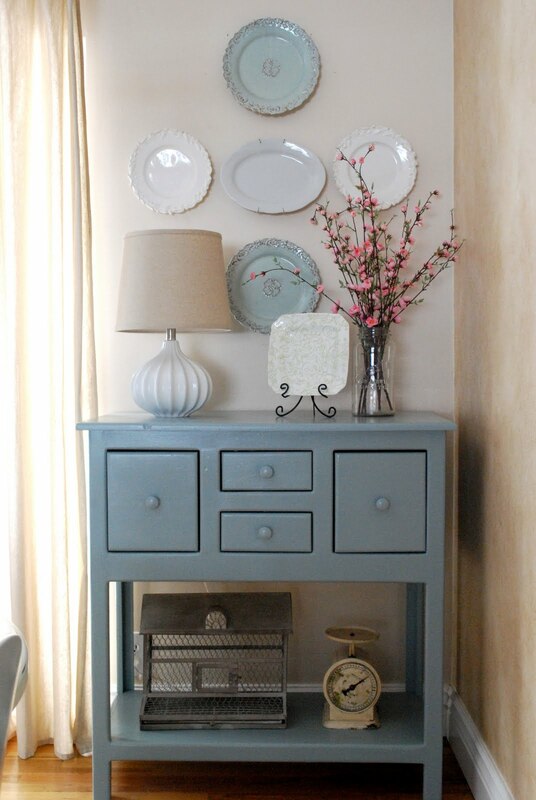 I LOVE that you keep redoing that same buffet/corner and it always looks so different. It's amazing how small things can make such a difference in how a space looks. Keep it up! Love it! Can't wait to see the tutorial. I have some subway art that I made using tracing paper and printed out words. Needless to say- it turned out a bit crooked. It's on my list of things to do (re-do) but I am not sure of the best way to tackle it just yet! It looks great! Black always makes things look more sophisticated. Two great looks! I love how you transformed the same piece by switching out the accessories! The black grounds the vignette and gives it great depth! What a great Idea... I am going to have to think about doing something like this to commemorate our family vacations. It looks awesome! I have to say I really like the plates, although both looks are good :) It has a real Nantucket, beach-house kinda feel which I love. Plus I'm envious of what I think is a set of scales on the bottom shelf...cute.